Ahoy there! My name is Mark Angus and I am the Sound Designer for Abandon Ship. This means I make all the sound effects and implement them in the game, as well as designing the systems for the interactive music, directing the dialogue recordings and generally doing anything sound related! Teaching Wwise implementation to curious games students. What Have I Been Up To In Games? 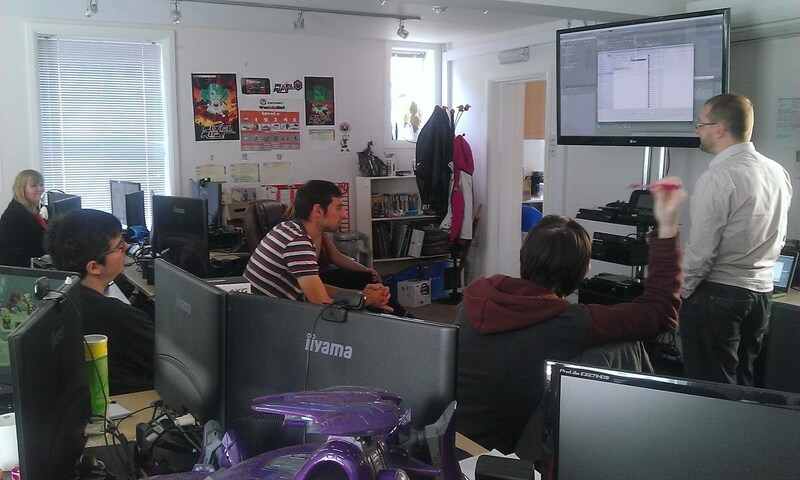 I’ve been in the games industry for about 15 years, working for companies like EA, Sega and Microsoft. I started at EA, working on big franchises like Burnout and Harry Potter but also casual titles like Trivial Pursuits! I’ve also worked on some cult titles elsewhere such as a Silent Hill and Alien: Isolation, for which I won a BAFTA for the sound. 3 years ago I set up my own company Gladestock Studios and now work as a freelancer on both game and television projects, as well as lecturing on sound design at a number of universities. Random games and boxes from over the years. When I was 5 my father brought home a ZX Spectrum with a spreadsheet program, a word processing program, and a copy of Hungry Horace. 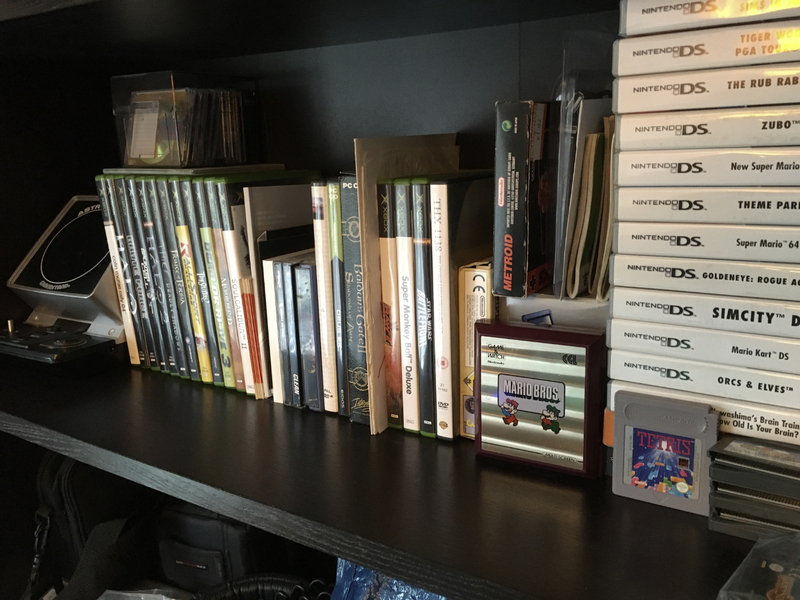 Rather than become an accountant or a writer, I became a Gamer! I lost most of my youth to that Spectrum, dungeon diving in Bard’s Tale or mushroom farming in Colony. In those days, you could copy a game simply with a double tape deck, and so many of my games were stacked onto D90s passed round in school, where one in 4 games on the tape would actually load! I have owned countless consoles and computers over the years, often choosing the wrong side of history with purchases like the Game Gear and the Atari Jaguar. Two really important machines that I got in my teenage years was the PlayStation and an Atari ST. Playing Wipeout 2097 and loving the music, I started writing tunes on the Atari ST, and this became the heart of a home studio of samplers, synths and mixers. 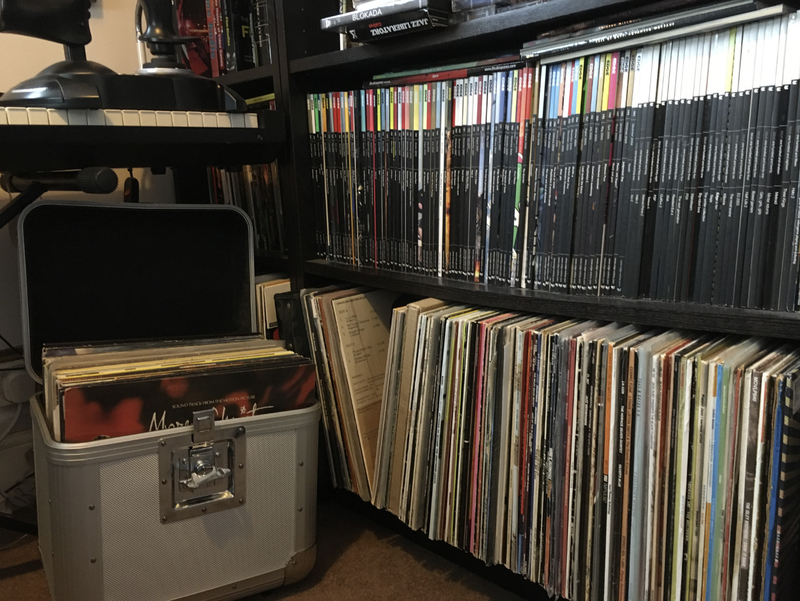 I hoard, and so my collection of EDGE magazines sits next to my vinyl collection. For about 10 years I wrote and released electronic music as well as playing in a band and DJing. Gaming was a natural part of being a musician – relaxing after gigs often meant getting lost in Elite: Frontier or Bass Fishing at 4 in the morning. My friends and I were all obsessed with games, and with space, and so playing X:Com was simply part of the process in the studio, with most tunes ending up with strange, astronomical names and voice samples from TV programs about NASA. The collision of my two passions really happened when my oldest friend started working in games and mentioned there were people in the building who made all the sounds and the music! Until then it hadn’t occurred to me that such a thing could be considered an actual, paid job. I went and got a degree in Film Sound and then threw myself into getting into games, which I finally did with EA. The heart of the Mothership! So after all these years I basically still have a home studio, only now it’s mainly used for sound design! 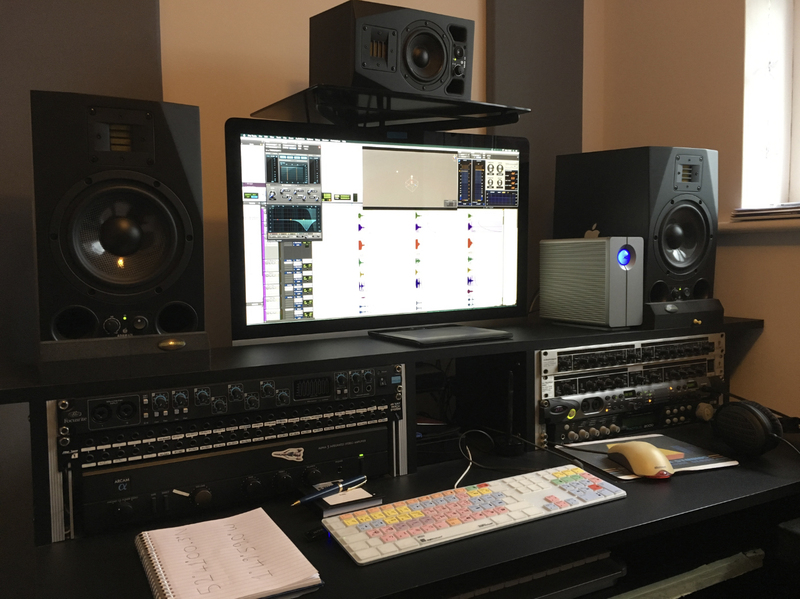 I run a Pro Tools HD Native rig on an iMac (that you can see is attached to the wall!) and for Abandon Ship I also work in Unity on the Mac. I am enveloped by a 5.1 system which means I can work on games and television in surround. I still write music in Logic, and occasionally still release under the name Trademark when I have time! Working from home means juggling a number of different clients and projects, uploading and downloading huge amount of data and fending off cats whenever Skype is on – they seem to love cat-bombing international video conferencing! It’s scary but so rewarding, and being on Abandon Ship has thrown me in with some similar pirates, I mean privateers. I suspect this isn’t what my father had in mind when he brought home the Speccy!